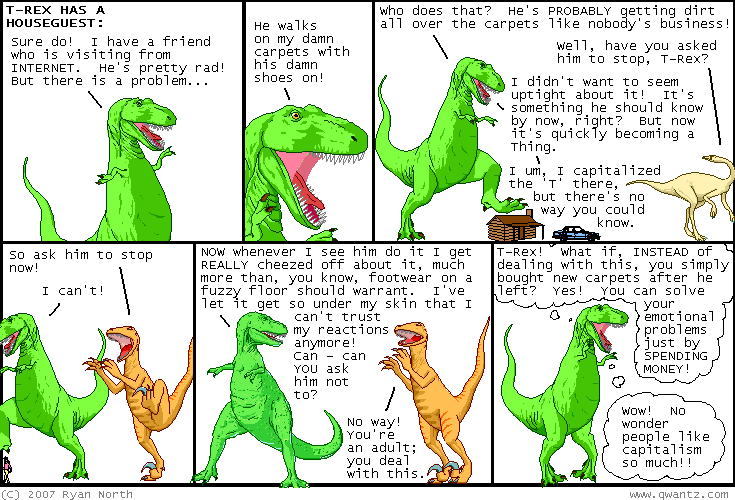 Dinosaur Comics - April 25th, 2007 - awesome fun times! –I'm a dude with a shredder now, ladies!! April 25th, 2007: I added a little box to the right there under the alluringly-titled "BIG UPS" that has all the HTML you need to put any particular comic on your web site or internet diary or whatever! You just copy and paste and it works AS IF BY MAGIC. I used computers to do this. One year ago today: how did i get 700 comics in without ever using 'viz.' before.